This is a fine and robust piece of solid oak furniture - the Madrid at its heftiest - with the two-metre dining table weighing in at a substantial 100kg, while the finger jointed design and chunky legs add to its sturdy nature. 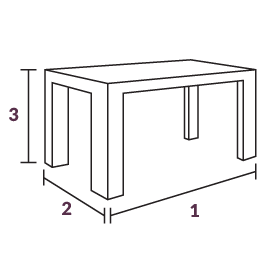 This table is supplied with extensions that are stored separately. The extensions will add an extra metre (100cm) to the table, they slot in to the table ends and are held in place with a butterfly screw underneath. When not in use, the chambers for the extensions are cleverly concealed with oak fittings. The extensions add an extra metre and thus make the Madrid extending dark dining table beautifully accommodating for large dinner parties and festive gatherings.